This was my first real weekend in Vientiane totally on my own. I actually had completely forgotten it was the 4th of July weekend until I read an e-mail from my mom. 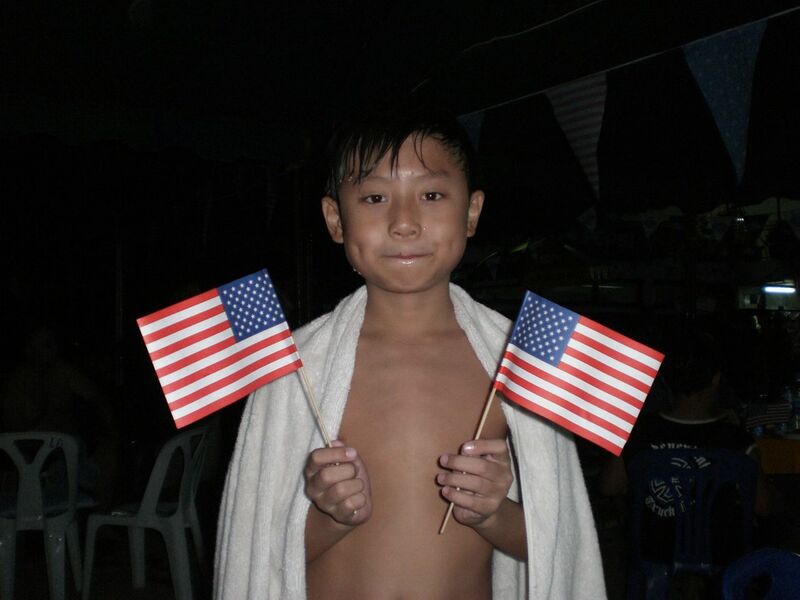 Around the same time, I got an e-mail from my neighbor, an Australian, who invited me to a 4th of July party held by the US Embassy at the Vientiane Swimming Pool. I was really excited about the prospect of meeting some anglophones and celebrating my nation’s birthday so I agreed to go, even though Ariya, my neighbor, could only stay for about an hour. Overall, it was a dissapointement. The whole event was a little strange. It was mostly old white men and their younger (but still older than me) Lao wives and children. 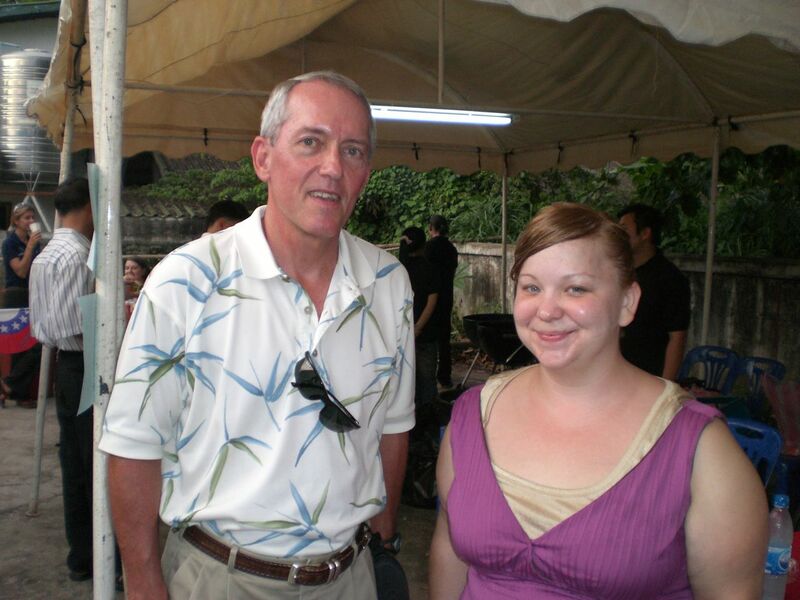 So I didn’t really get to make any friends, but I did talk to the ambassador, who is a pretty awesome guy. He did Peace Corps Senegal back in the 60’s, and has worked all over, Burkina Faso, Niger, Indonesia, etc. He also read a letter, written by our current president, to Americans around the world, that included some line about America being “the greatest country in the world”, which I think I actually laughed out loud after hearing, which may or may not have alienated me from my fellow Americans present at the event. But there was a bbq, with burgers and hot dogs! They played the antional anthem, and we stood, which for me was the first time in I don’t know how many years. I think the last time was probably when I went to a Sox game in 2006. I did talk to one girl, who is just in town for a few weeks, and we’re going to have dinner tomorrow, but surprisingly the whole affair was a lot less classy than simmilar events I attended in Benin. The American community in Laos is actually really small, it would seem. Anyway, I didn’t stick around too long after Ariya left, since I haven’t been feeling too sociable lately and there was hardly anyone between the ages of 18 and 40 present. However, I did enjoy talking to my neighbor a lot, who was a Lao refugee who moved to Australia when he was 10, and then at 30 decided to come back to Asia. This afternoon I went to lunch at my friend Sisavanh’s house. She is a lady I work with, who is doing a Masters degree in TEFL, and always asks me to correct her homework. So, I basically invited myself to her house, in a round-about way, in exchange for all of the help I give her. I was expecting just a small lunch with her family, but it turned out to be a huge party, with her husband’s cousin from Las Vegas, and about 20 other people. I was hoping to see some Lao cooking in action, and help out, but instead they just kept serving me drinks and chatting, but I did learn how to make sticky rice. I asked them if they had ever eaten dog, and no one would admit to it! But I did get them to promise to take me sometime to eat dog, and drink Lao whisky. I actually had an extremely productive weekend, I did laundry and got a bunch of house hold goods, including: two plates, two bowls, two spoons, two forks, a tea cup, a knife, and a cutting board, and a lamp, among other things. So my house is starting to seem more like a real house, and with the air conditioning, I hardly want to leave. Still no stove or pots and pans, but that is next on the list.